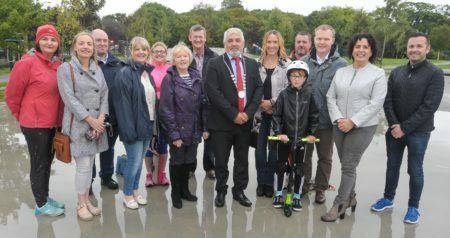 Ballincollig/Carrigaline Municipal District Chair Cllr Joe Harris has officially opened Cork’s newest and much anticipated Skate Park in Carrigaline. Located at the People’s Park, entrance off Church Road, the state of the art recreational facility cost in the region of €220,000 was principally funded by Cork County Council with additional funding from the Department of Culture, Heritage and the Gaeltacht Recreational Grants Scheme. Cllr Joe Harris, centre, chairman of the Ballincollig/Carrigaline Municipal District, at the official opening of the skatepark in Carrigaline, along with Siobhan Walsh, Clare O’Mullane, Geraldine O’Hara, Kathryn McSweeeney and Betty O’Riordan, all Carrigaline Tidy Towns, Jim Molloy, Kevin O’Regan and Vincent Florish, all Cork County Council, local councillors Marcia D’Alton, Seamus McGrath and Maryrose Desmond, Stephen Marsh of Lulu’s Coffee Dock and Alex Barrett from Pouladuff Road. 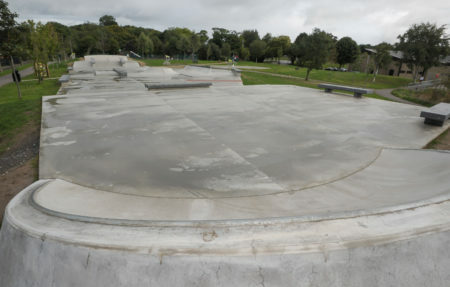 The skate-park, designed for use by ten year olds and older, will be a positive resource for the young people of Carrigaline as well as the greater community. Commenting on the development, Chief Executive of Cork County Council Tim Lucey noted how the project is a further example of the Council’s continuing efforts to improve recreational facilities throughout the county and, together with the installation of the running track, the Playground, Multi Use Games Area and Tone Zone equipment, will add another dimension to the Park. The official opening was a fun family friendly event for all ages with face painting and a puppet show keeping the younger attendees entertained together with some impressive skating demos and a skate board Jam. The skate park is open to everybody aged 10 and over.